Open this email and click the relevant links and download your Free Gifts. Well, I have a challenge waiting for you inside the email. Note: If you couldn’t find the email then do a search for ‘ aj@awesomeaj.com ‘ in your mailbox and you will find it for sure. But if you are using GMAIL then probably you haven’t seen the mail in your inbox. As GMAIL has changed its algorithm last year most of the emails get delivered to other tabs and folder then the inbox. It’s not good that you have subscribed but struggle to find the emails in your inbox. 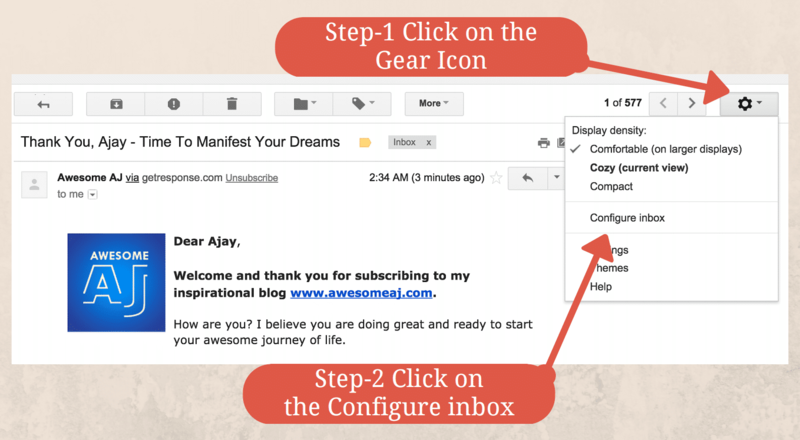 If you are using any email other than GMAIL then no problem, head over to your inbox and start reading. 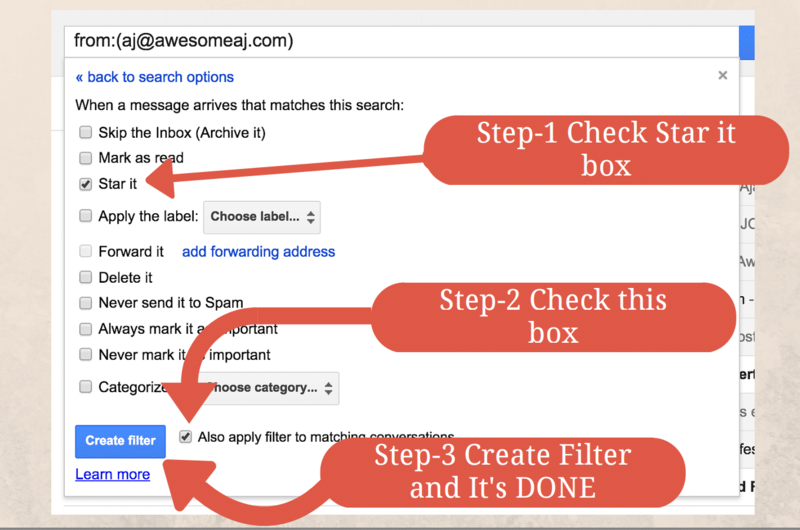 But if you are a GMAIL user, then please take 5 minutes of your time and do this mailbox configuration so that you will get all my emails in your inbox always. Yes, it will take ONLY 5 MINUTES. And I am going to guide you STEP-by-STEP now. It’s worth giving 5 Minutes than missing valuable resources and FREE GIFTS. STEP-1. 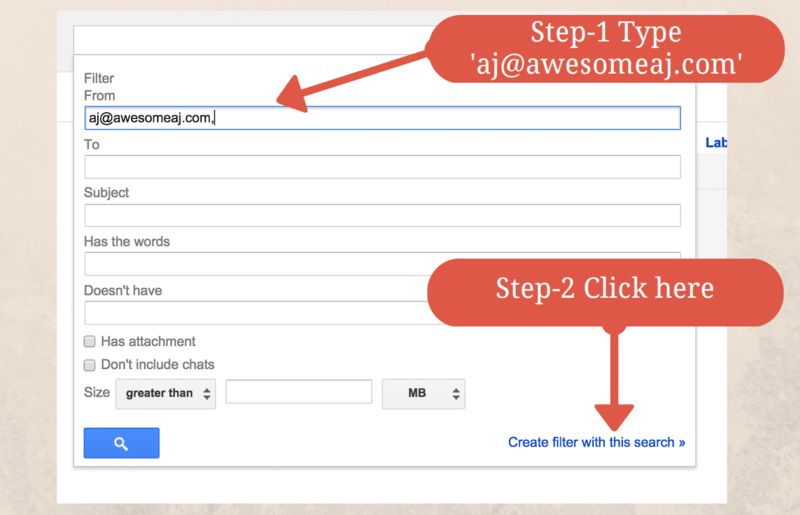 Head Over to GMAIL. If you can’t see my email in your inbox. Check here. STEP-3. 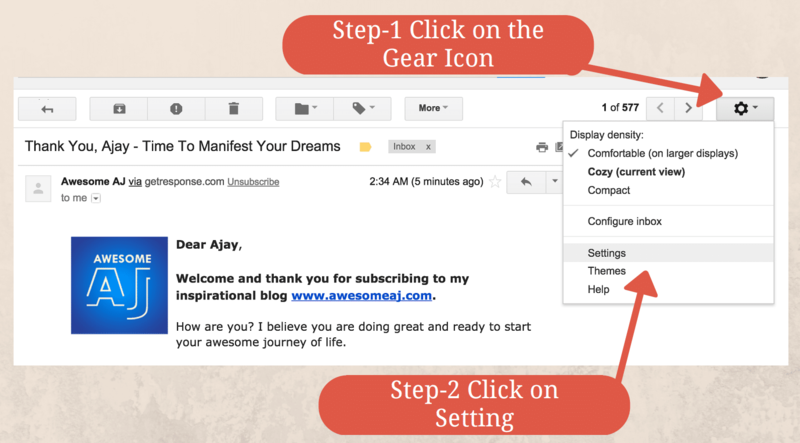 Open the Email and Start Doing the SETTING. STEP-4. Make it Starred and save. STEP-5. Again click on the Setting Gear Button. STEP-6. Click on the FILTER tab. STEP-8. Set aj@ awesomeaj.com in the from the field and create the filter. STEP-9. Finally Setting Up the Filter for aj@ awesomeaj.com and it’s done. WOW ..that’s awesome. 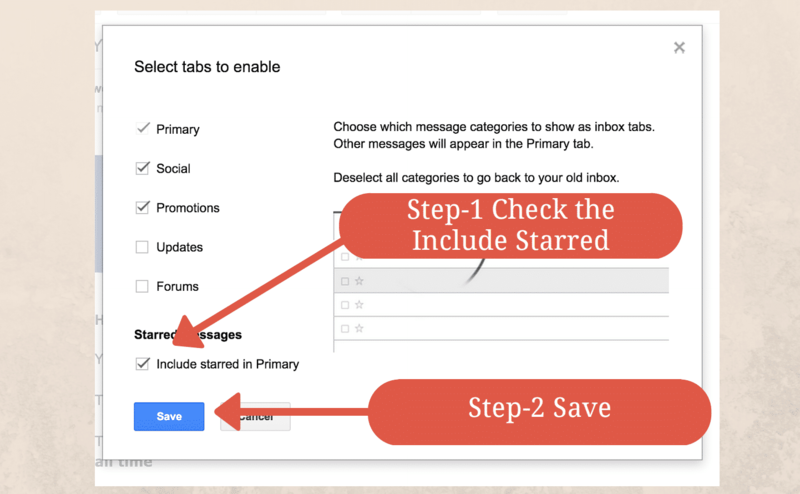 It just takes 5 Minutes but ensures that you will never miss a single email. Also, join me on FACEBOOK and YOUTUBE for more Motivation. Thank u so much,really I’m so much happy to join this free course,you r really awesome,I can’t explain my happiness,thank u,thanku,thank u.
Loads of Gratitude Ajmari.. stay magical and leave your dreams. You are awesome. Hi….i am nearly to my 17 magic day and yesterday night i dream that i got a cheque and i remember the amount. You think is a sign from the universe and maybe is good to write that amount on my check? I am the ranker of 2018 civil services exam with IRS service allocation.. Tons of Gratitude to you. Thank You so much for this. Your blog and you, sir, is awesome. Hello…Ajay sir…I’m very happy that i can do now ur awesome course for free…..yahoo…..so muchmuch thank u.. I am suffering anxiety depression from last year. I got unsuccessful in final year exam. Now I am searching the job. Also I want to learn special courses in my field. I am not in any relationship also. Please consult me about my confusing situation. Atul, you keep doing this course or highly suggested join my 28 Magical Practice Course. It will help you. Move away from wrong relationship and build a happy life. thank you aj from Ethiopia horn Africa………..i am sure it gonna be great. Welcome to the Law of Attraction Journey Alpa. May I say thank you Awesome Aj for educating me and giving me the tools in which I can improve every aspect of myself and my life. 10.2.16 will be the first day i start to apply your teachings to my life. The first day of my journey to a greater me a greater life a better me a better life. I’m going forward to write my future. Tons of gratitude.. the journey will be phenomenal for you. I am looking forward to attract my dream job and life partner. Thank you universe for sending me a guide @awesomeaj. Thank you so much for your motivation , i am really very exciting to hunt your 21 days course. God bless you ve a healthy life. Thoughts mould life. Loads of Gratitude to You. I’m so grateful to join your Law of attraction course . You have come in my life as a magician . I’m suffering from catract both eyes .I want to heal my eyes. Rupesh please follow the self-healing post on this blog it will help you heal yourself. You need to be in process of transformation. I would highly suggest you to join our 28 Magical Practice course. Check the details here. Thank you sir, I am really very happy to join in this 21 days course. I hope this wonderful journey will change my life in a positive way. Thanks a lot for your invaluable guidance. Thank you thank you thank you so much for accepting my request 2nd time to join this free course.. Thank you for accepting me to join this course.I believe in law of attraction, daily I practice it my own.can we use it for others also? ?.like for our kids.studies,development etc. thank u so much aj sir…..
thanks for allowing me to pursue this course free of cost…..
I’m excited and happy to join this course sir , have heard alot about you and really want to follow your teachings in my life. I’m already practicing LOA and manifesting my dreams , day by day my faith is increasing and really want to learn more . That would be great Neena, if you are yet to register then register today for the workshop. Now, i have done subscription for free 7 Days online law of attraction course. Thank you so much for providing such valuable course for begineers. Starting this 7days course from today… Hoping for the best. I will be a positive person. I will manifest my desires. I will manifest love of my life. I’ve been listening to many of your videos and explanations – and trust me I had no idea that all through my life I was so wrong in perceiving the things. You have really opened my eyes. I am definitely going to try manifesting my wishes the way you have mentioned and let’s see :). Thanks a lot for the great work you are doing. By the way even I am working in Accenture. Thank you so Much ajay sir for offering us free LOA class. I follow you on youtube too. I am so happy that i am going to start my class. Hi AJ, I am a regular viewer of you. It is very inspiring really. I am a hopeful person and your videos help me more not to loose hope in tough times. I have a request plz make a video how to the mindset of enemies. I have a particular enemy and that person can do anything to hurt me. So plz I don’t want to waste time on fighting and i want everyone happiness. So plz make a video to change the mind of an enemy. Hello Awesome AJ, I should say that your name does absolute justice to you. You are indeed awesome. I have been listening to your videos on youtube now and I absolutely love them. I have subscribed to your youtube channel as well. I have started doing a few things that I like and I feel good. I know the universe will bring my manifestions to me when the time is right so I’ve put it out there and now enjoying life. I understand my manifestation need to be aligned with many other factors but why should I care 🙂 Thank you for taking time out and compiling such amazing content for all of us. I look forward to some day getting to talk to you and share more. Thank You, Thank You, Thank You. Thank you so much Sir for this opportunity.. From so many days I am thinking about it.. Thank you so much Ajay Sir for this opportunity.. From so many days I am thinking about it.. Thank U so much sir for providing such course .I know this will be very helpful for me to make my relationship best. Hi Aj I am living very stressful life. Nothing is good in my life. I am not earning money also. I don’t know. I have many problems. I don’t know how to solve it. Please help me. hi AJ I’m Mahsa from Iran. i’m really happy that i found you, whenever i watch your videos they make feel much better. you are from heaven thaaaaaaaaaaaanks alot. Can I use Law of attraction technique for my daughter to secure a job ? ?